Josh McDowell is maybe one of the best-known defenders of the Christian faith. With ‘Don’t check your brains at the door’ he’s written an easy-to-read defense against many common myths about Christianity for teens. Each chapter ends with ‘Brain food’, a couple of questions that delve deeper into the topic. The questions often refer to specific Bible passages that the student is encouraged to read. 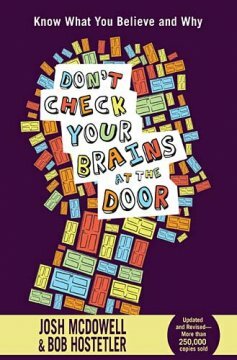 I loved the concept of Don’t check your brains at the door, since we know from research the high school and college years are a tough period for many young people. Their faith is attacked, put to the test and not all come out of it with their faith intact. A book like this could help them find answers to questions they encounter, could help them defend what they believe when under attack. I’m just not sure the book quite does that. While most of the chapters use examples from real life, some also include fictional stories, written like a story. Chapter 4 for instance (tackling the ‘myth of Jesus a just a good teacher) is written like a strategic meeting from demons about how to best attack Jesus. It just doesn’t work for me, and neither do some other chapter that use fictional stories. The best chapters were the one that were more or less straight on, identifying a myth and tackling it. My second problem with the book is that I think there were too many myths being tackled. I’m guessing the main thought was that the book has to be easy-to-read, to not scare off teens, but because there were so many subjects included, all of the chapters are really short. That’s a shame because there are some really good arguments in there against often-heard attacks, myths and reasonings. Explaining these in more detail would have given teens more proof or incentive to change their belief system. I think the book could have benefitted from omitting the entire last section on life and happiness and devoting that space to the previous sections. With all respect, but tackling the ‘love-at-first-sight- myth’ or the ‘conformist myth’ (everybody’s doing it) is kind of unimportant when someone’s not a committed Christian yet. It focuses on behavior instead of belief, on rules instead of relationship. I loved the ‘brain food’ sections, because it’s here that students are encouraged to use the Bible themselves to find answers. It’s basically a really short Bible study that further explains the defense against a particular myth. If the readers would all do these sections, I’m sure they could benefit immensely. Whether they actually will, I don’t know. Discussing a chapter each week in a small group would certainly help. Does this all mean that I didn’t like the book? Not at all. I did like it, I just think it could have been better and stronger. Don’t check your brains at the door certainly gave me some ideas and input for self-made small group studies. Josh McDowell is really good at apologetics and he presents strong arguments (rational argument, hence the title of the book) against many myths about God, Jesus and the Bible. Teens will certainly benefit from reading and discussing these.